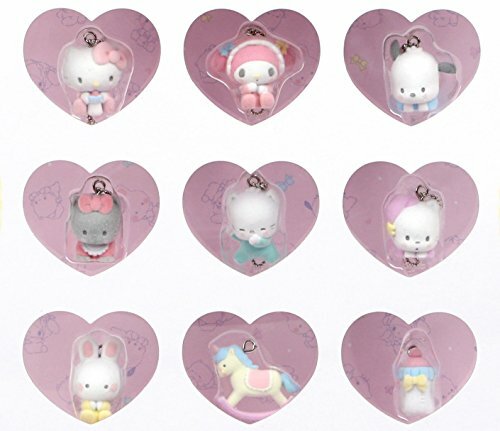 Make someone's day with this 9-piece mascot flocked keychain set featuring some of your favorite Sanrio characters as babies including Hello Kitty, My Melody, Pochacco, Nye and two other kitten siblings from Nya Ni Nyu Nye Nyon and Cheery from Cheery Chums! Each mascot is covered in a soft flocking. Hang this ball and chain keychains from your keys, backpack, or purse. Or keep them in the baby bottle shaped package. Supercute! Part of the Sanrio characters Babies collection.